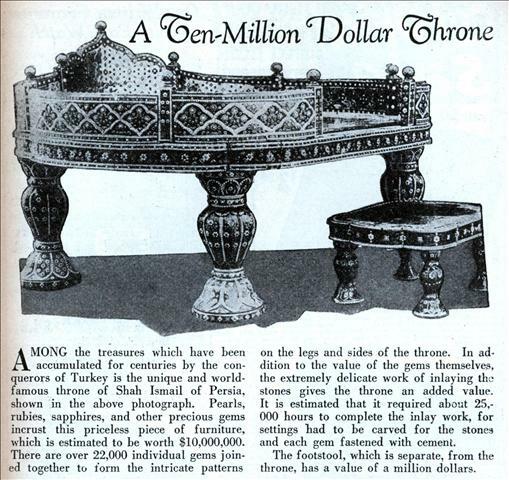 AMONG the treasures which have been accumulated for centuries by the conquerors of Turkey is the unique and world-famous throne of Shah Ismail of Persia, shown in the above photograph. Pearls, rubies, sapphires, and other precious gems incrust this priceless piece of furniture, which is estimated to be worth $10,000,000. There are over 22,000 individual gems joined together to form the intricate patterns on the legs and sides of the throne. In addition to the value of the gems themselves, the extremely delicate work of inlaying the stones gives the throne an added value. It is estimated that it required about 25, 000 hours to complete the inlay work, for settings had to be carved for the stones and each gem fastened with cement. The footstool, which is separate, from the throne, has a value of a million dollars. Doesn’t look very comfortable, maybe he should have got a laZboy.
. . . And when it showed up at Antiques Roadshow, the Keno brothers were speechless!